Whatever the approach to carbon pricing, it should be paired with strong outreach that builds support within the administration, staff, and student body and educates those making operations decisions on how best to use the program. 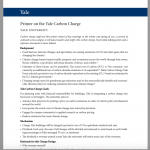 This section contains examples of communications about the Yale Carbon Charge and examples of energy reports from both Yale and University College London. Samples are representative of the population to which the policy will pertain. Only test approaches that are viable at full-scale. It is a waste of time to run a pilot knowing that, say, university leaders will not be supportive regardless of the outcome. Carrying out such tests can lead to confusion and program delays. 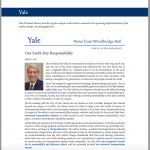 Background on climate change, Yale’s goals in implementing a price on carbon, key details on the rationale and mechanism of Yale’s approach. This served as preparatory and leave-behind material for meeting with administrative unit heads. Template letter Yale Carbon Charge staff used to invite deans to volunteer their buildings as part of the carbon charge pilot study. 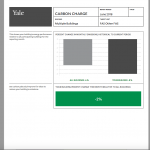 Four examples of the reports the Yale Carbon Charge staff send each month to key financial, administrative, and facilities staff for each building and unit participating in the carbon charge. Reports for Beinecke and Kline Geology Lab are for individual buildings. Reports for the Faculty of Arts and Sciences and the Central Library are for entire units, which are responsible for multiple buildings. 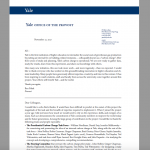 Email sent to Yale campus community. 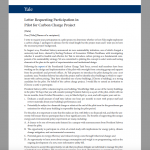 The Carbon Charge staff worked with the president to write this email announcing the upcoming implementation of the carbon charge. 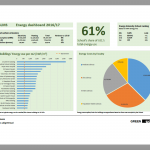 Sample energy dashboard for University College London, used to show emissions data to departments. 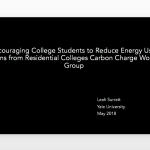 In 2017-2018 a group of Yale College students inspired by the carbon charge formed and developed communications approaches to encourage their peers to reduce energy consumption in Yale’s residential colleges. This summarizes their work. 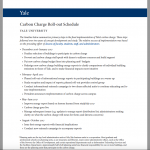 Email sent to Yale campus community thanking those involved in implementing the carbon charge. Timeline outlining phases in the implementation of Yale’s carbon charge.